This elegant RFID blocking secure women's clutch wallet is shielded to protect you from electronic pickpocketing. 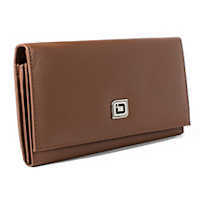 It has 13 card slots, plus 4 large shielded areas to accommodate bills, a checkbook, and even a full-size passport book. There are 2 zippered compartments for change or keys. 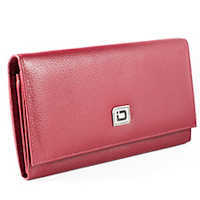 This clutch wallet with a checkbook features a snap fastener.